Music coming from the traditional drums wakes up Burmese people and reminds that Thingyan, the water festival that welcomes the New Year is getting near. Temporary tents or small pandals at every corner of streets and roads, built with coconut fronds, are seen with people from all ages being together and making special festival food. Such special food can’t be separated from the water festival; it is sweet rice balls that we call mote-lone-yay-paw in Burmese. Every Burmese enjoys that sticky rice balls with small pieces of jaggery inside. One lovely feature of the water festival is people gathering together, sitting and making mote-lone-yay-paw under the coconut frond shelters. Some young people even put chilies inside the rice balls instead of sugar palm just to make fun of their friends getting hot and go crazy when he or she eats it. As we all know, Burmese people are generous, everyone who passes by the shelters or pandals are treated with food. You don’t even need to cook for four continuous days. Just get yourself out and wander around. Well, you like to stay at home during the festival? No worries, people send food to nearby houses and monasteries. 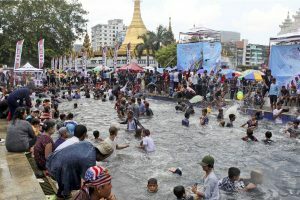 Well, this is the first month of a year in Burmese calendar and the whole country celebrates water festival enthusiastically to wash away sins, discontent and anxieties of the previous year. At the same time, Thingyan flower called “Padauk” blossoms around the country, but only after they are poured out with raindrops. Then does it rain in summer? Of course, Thingyan rain is punctual. It knows that everyone including Padauk is longing for it. Thingyan is given a glow by the golden Padauk, the special April flower. For us, Padauk tree is also a symbol of strength and durability as its timber is strong and hard. Plus it’s easily and quickly grown, giving cool shade. We, Padauk lovers go crazy when Padauk blooms with the first showers of April rain. People are eager to offer the first bloom of flowers to the Buddha either at pagoda or to a Buddha image at home. On the day a Padauk tree blooms, you can see ladies with Padauk flower on their entire head or those who beautifully wear long necklace of flowers. Padauk is magical but once a year and just for a day. Although different Padauk trees flower at different times, all trees flower within April. That’s why a man who wants to shows his loyalty and faithfulness to his beloved one compares his love to Padauk, saying he is as loyal as Padauk and he can only love once in a lifetime. Well, we make a joke about it as well. If his love is the same as Padauk, it means that his love withers so quickly, since Padauk flowers last just for a day when they are plucked. Padauk signifies youth, romance and love. Many Burmese poets and writers have composed the beauty of Padauk, which covers the whole tree with its golden petals, and the sweet fragrance around it when wind blows hard. Even some composers use metaphor saying that Padauk bewitches the eyes and shakes the hearts, and a mixed beauty of emerald (branches) and gold (flowers). Then no wonder that Padauk figures largely in heart and soul of Burmese people. Besides, it has got a place of honor in lives of us. Traditionally, all activities that we perform during Thingyan and New Year’s days are supposed to be done with good deeds. So various good deeds are done in order to welcome a prosperous New Year. Young people do hair washing and nail cutting for the elders. Letting birds or fish free and various kinds of donations to monks are also done to call for a good year. Plus on the first day of a New Year, the ceremonies of Buddhist recitation by monks are celebrated on streets and roads to keep houses and regions out of devils. It is believed that Tha-gya-min (King of Nats) annually visits human land during a-four-days-festival; he takes a look whether people are doing good or bad. The names of those who do bad things are recorded on a sheet made of dog leather whereas those who behave well are written down on gold paper. When we behaved badly and complained to our parents when we were young, our parents used to say: “OK, Tha-gya-min is watching you and he already recorded your name on a dog-leather-sheet.” Who knows he is watching us or not? Anyway, it’s better to always behave well. Oh, it’s only a couple of days left to get to a new year. I am myself really excited now, writing this article. Wish you all the best and a prosperous New Year!! !